KITSAT-1 (Korean Institute of Technology Satellite) was a collaborative research mission, encompassing the installation of a groundstation in South Korea, participation of Korean engineers in the UoSAT-5 mission, technology transfer and training of students on the MSc courses at Surrey, and the involvement in a engineering and flight microsatellites. 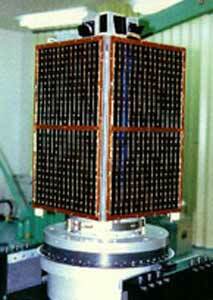 KITSAT-1 was developed and constructed by a team of Korean and SSTL engineers. It was based on the 35 cm × 35 cm × 67 cm modular microsatellite bus previously flown on UoSAT-3, -4 and -5. Power was provided by body mountes solar cells. Attitude control was provided by a gravity-gradient boom and active magnetorquering. The DSPE comprises two Texas Instruments DSP microprocessors operating independently or in parallel. The purpose of the DSPE is to broadcast stored speech, relay compressed speech in real time, and implement advanced data link modulation techniques. For Amateur Satellite service, the PCS provides digital Store and Forward communications for stations. The system uses standard protocols for message forwarding, with 9600 bps uplink and downlink rates. The PCS contains 13 MByte CMOS SRAM storage. The CRE is an experiment for radiation environment research and monitoring of its effects. It consists of a Total Dose Experiment (TDE) to measure total ionising dose, and a Cosmic Particle experiment (CPE) to monitor energetic particle events. The data collected from KITSAT-1's high altitude, inclined orbit were compared with that available from the UoSAT-3 and UoSAT-5 missions in 800 km polar orbits. The follow on mission, KITSat 2 (Uribyol 2) was very similar, but flown in a different orbit. This time, the satellite was completely manufactured by the South Korean team at KIT. The purpose of the KITSAT 2 mission was to improve and enhance the KITSAT-1 systems, to use domestically manufactured components, to demonstrate experimental modules and to promote domestic space industry.